I dont think of myself as a fan of structured clothes, I love loose layers & soft dresses. However I must say Ive got such a lot of wear out of this hot pink structured blazer that Im starting to re-consider..
Brogues: DIY, Cuff: H&M, Glasses: Gok Wan for Specsavers. Trying to inject some colour into my wardrobe saying the weather is so grey and crap..apparently its summer but Ive seen no proof of this. Love all the colours of your outfit, & the trousers are lovely! I know what you mean, I keep trying to wear more colour but the weather is so miserable at the moment I can't be bothered! XO. I really love the purple with the pink! And yes, it's July in a few days... Where has our summer gone?!?! WOW! I love your outfit! The colour of the blazer is so bright! Your diy sprayed brogues are amazing too, I'm definitely buying myself some spraypaint! The colour combinations in this outfit look so amazing on you. 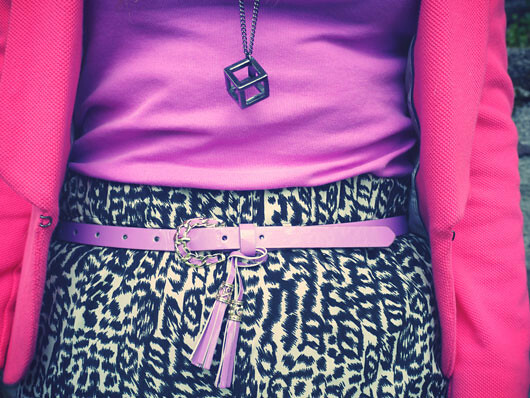 I love the monochrome printed trousers with the bright lilac and pink! Very cool combo. Love those pants. i love ALL your glasses you sport. i was just curious...how many pairs of glasses do you own? Really like this look, plus it's so colourful which is a definite win from me! oh this is a really cool look! Oh I wish i could pull off glasses like that. I'd love to have a nice pair to save me having to wear my contacts all the time but they just never suit me! I love the blazer! Think a little trip to H&M is in order! You look great, I really like your blog and your look. Your draw to colour is one of the reasons I love your blog! YOu always look so vibrant! I made my friend buy this blazer, it's amazing! 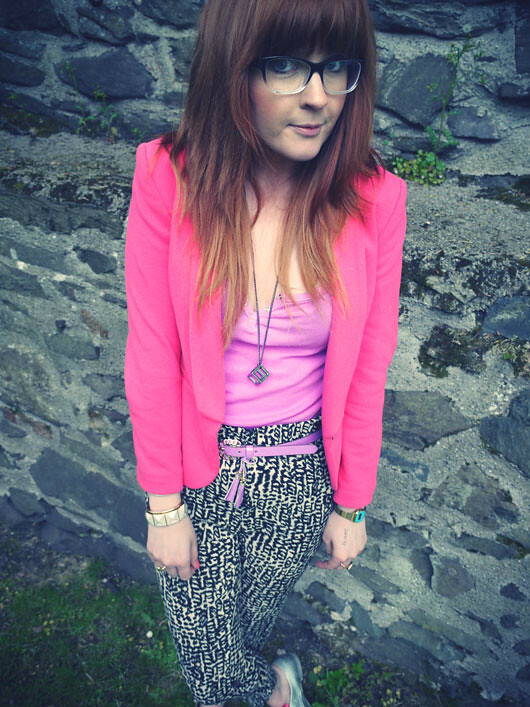 I adore this blazer, I wear my pink one so often, especially when it's miserable! Such a nice colourful outfit - cheering up a rubbish summer! Love your trousers! Your hot pink blazer is amazing! I really love it with your cool patterned pants. Everything looks wonderful together. Such a gorgeous look - I'm in love with that blazer! I love your outfit and I especially love your glasses! Loving all the colors on this look. Followed you! oh wow, I love your style!! So much pink!! Love this outfit. The blazer really suits you and you look lovely!